This Nautilus U614 vs Nautilus U616 comparison is the most complete look at these two upright exercise bikes match up against each other online. This will help you to see just how they are alike and where they aren’t. There are a lot of similarities as U616 is an upgraded version of the U614. But there may be more differences than expected. And the big question is whether those differences are enough to justify the U616 costing more than the U614. But before getting into those differences here is a quick review of the 2 bikes. The bike can be used by multiple people. You can adjust the resistance to the level that is right as you go or choose from one of the pre-set programs for your level of fitness. It gives you plenty of variety and scope. Choosing a workout program and using the console is fairly easy to do, although it does help to have the manual at hand to get started. It also has an adjustable seat that you can move vertically and horizontally to be able to get the best fit for people between the heights of 5ft and 6ft 2 ins. Up to 4 people can track and monitor their workouts and exercise with the bike and the Free app and fitness account. This bike is similar to the U616 and also has a good range of features but not as many. To provide for different fitness levels and requirement it comes with 20 resistance levels. You can manually adjust them or when following a pre-set program it is adjusted for you automatically. It also has a range of pre-set programs that cater for different abilities and also provide variety to your workouts. You can adjust the seat height to get it into the best position for an effective workout. It’s quick to do and it fit people between the heights of 5 ft and 6 ft 2 ins. The Differences – How They Don’t Match Up! The Programs. The U616 comes with more programs than the U614. With the profile programs where resistance changes over time it has 12 compared to 9. It also has more heart rate control programs where resistance is changed to maintain your heart rate in a chosen zone – it has 9 compared to 8 (one that you can choose the percentage of the maximum heart rate). It has 2 fitness tests compared to just the one for the U614. Resistance Levels. The Nautilus U616 has 5 more resistance levels with a total of 25. Rather than providing a wider range it provides more of a smaller increment between the levels. Both do provide smooth transitions between the levels and there are no huge increases or decreases to cope with. User Profiles. The U616 allows you to set up 4 different user profiles that help with tracking, heart rate control programs and more relevant measures (calories) for 4 people. The U614 only allows you to do this for 2 people. Neither has guest profiles so anyone who uses the bike that doesn’t have one set up, their workout results gets added to one of the existing profiles. Seat Adjustment. The U616 seat can be fully adjusted vertically and horizontally with the Nautilus U614 the adjustment can only be done vertically. The horizontal adjustment can help you get a more comfortable position in relation to the handlebars not that anyone has particularly been concerned with that with the U614 but it may help if you have longer or shorter or upper body than average. Crank/Pedals The Nautilus U616 has a stronger and more durable crank with it having a 3 piece crank compared to 1 piece. Both are durable but the 3 piece will stand up to harder levels of resistance and standing on the pedals for longer due to how they are made. The Nautilus U616 pedals are oversized giving you a better platform for pushing and also getting your foot properly positioned on the pedal especially when you have feet size 10 and over. Also the Nautilus U614 when your feet are size 10 and over some people hit their ankles or heels on the crank arm if they don’t change the position of their feet on the pedal (it has a straighter arm). This doesn’t seem to be a problem with the U616. Weight. There is only a small difference in weight between both bike with the U616 a half pound heavier at 68.6 lbs. Both have transport wheels at the front to help with moving the bike from place to place. Heart Rate Monitoring. The U616 gives you the ability to wear a non-coded polar heart rate strap (needs to be bought separately) to monitor your heart rate and for using with the heart rate control programs. You can also use the hand pulse sensors in the handlebars that come with the bike. The U614 just has the hand pulse sensors. Bluetooth. 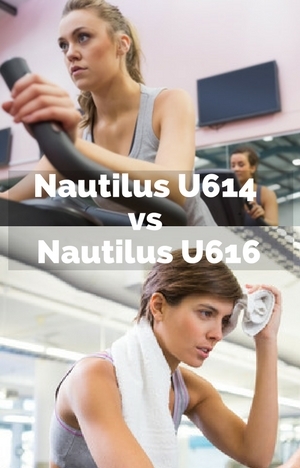 The U616 has Bluetooth capability to work with the Nautilus Trainer App, Nautilus connect and sync with myfitnesspal.com. You can upload your training data without having to use a USB stick. There is no additional functionality than that at this point. The U614 doesn’t have bluetooth so if you want to track and analyze data and/or sync with myfitnesspal.com this needs to be done using the USB port and stick. Elbow Pads. The U616 has elbow pads whereas the U614 doesn’t come with these. They might seem a little thing but if you plan to be leaning on the handlebars for a period of time you’ll be glad of them as they’ll reduce pain and ache in the forearms. The Nautilus U616 when I checked was $180 more than the Nautilus U614. If you want to be using the heart control programs then I think the Nautilus U616 is probably the way to go due to the more reliable heart rate monitoring that you can get with a heart rate strap. As you may find with the hand pulse sensors you can’t get a reliable reading and thus won’t be able to use the programs. An alternative If you just want to read your heart rate and not use the control programs you could buy the U614 and if you don’t get the reliable reading you could buy a strap and monitor it separately to possibly save some money but with some added inconvenience. The U616 crank can take more punishment that the U614 so if you expect to be pushing hard against the resistance and get out of the seat regularly then I’d consider it over the U614. Although there hasn’t been reports of issues with the U614. Also, if your shoe size is 10 or above you may find with the U614 that you bang your heel and possibly ankle on the crank arm depending on how you position your feet on the pedals. Those considerations aside I’d go with the U614 at the current price differential as it seems quite a bit to pay for more programs and the ability to upload data using bluetooth rather than a USB stick. In the table there is a side by side comparison of the two bikes showing features, specifications and dimensions to give a better overall picture of how they are the same and where they differ (without explanations). Hopefully you now have the information you need to choose between the bike and can make your decision to buy. It would be great to know your thinking on these bikes.